Create a lasting impression while professionally presenting your brand. Custom Printed, Full Color Table Covers, Table Throws and Table Runners with Your Logo. 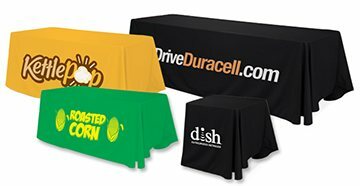 Custom table covers can give your company or organization a competitive edge with a professional look. Your logo will draw plenty of attention on our durable premium polyester fabric. No matter what type of event you're planning, we have custom tablecloths in every size to fit your needs. Our 6-foot table throw styles are perfect as trade show table covers. We also have roomy 8-foot printed tablecloths and smaller 4-foot styles. Our custom table runners are a great accent to any table banner or perfect on their own. Draw prospective clients to your booth with attractive and affordable trade show table covers. The appearance of a professional-looking trade show tablecloth will bring a positive image to your business. Printed table throws for exhibits and imprinted table runners help promote brand awareness at every venue. Your neatly printed name and logo will greet visitors who stop to check out your giveaway merchandise, company flyers, business cards and samples displayed on your customized table cover. A smooth and great-fitting tablecloth is also an important tool for success at career fairs, conventions, hotel events, business expos and more. Custom Table Runners For Trade Shows A table runner or runner is simply a long section of printed or dye sub cloth. We do a full dye-sublimation printing process which will allow custom colors and images. Printed table runners dress up your show tables and attract customers! Colorful custom table runners accent your event displays at a fraction of the price of a full size custom table throw, table cover or table cloth. Make your table stand out without spending a lot of money. Your unique design on these custom table runners will make a big impact! Order your trade show table runners with your logo, artwork, and custom branded image. Create & purchase custom table runners for your trade show, concerts and events to fulfill your advertisement and promotional needs. Dress up your tables with a high quality, custom printed table runner from LogoExecutives.